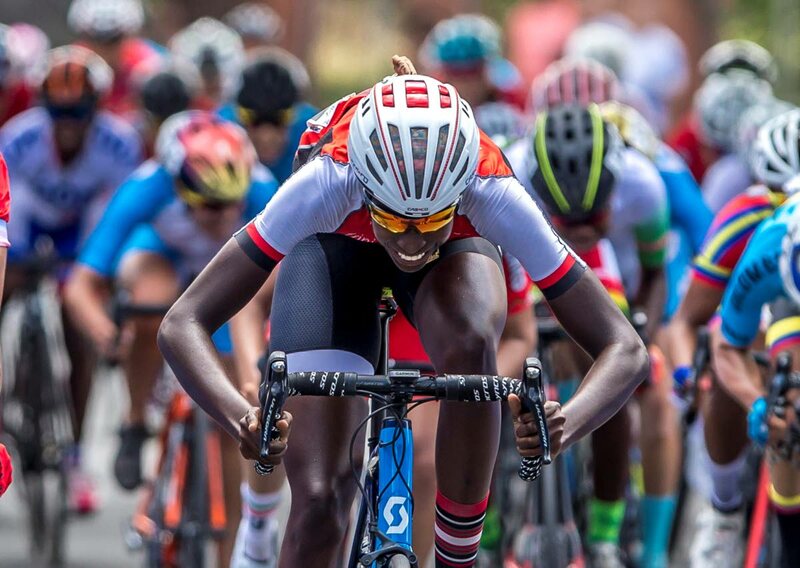 In this file photo,Teneil Campbell sprints to victory in the women’s road race, on July 28, at the 23rd Central American and Caribbean Games in Barranquilla, Colombia. TOP NATIONAL cyclist Teneil Campbell and Alexander Smith, operations manager for the Perfection Services Limited (PSL) Cycling Club, paid a courtesy call to Minister of Sport and Youth Affairs Shamfa Cudjoe and Patrice Charles, director of Physical Education and Sport, on Tuesday. The meeting took place at the Parliament Building, Wrightson Road, Port of Spain. Cudjoe congratulated Campbell and presented her with a cheque, in recognition for her (Campbell’s) recent feats at the CAC (Central American and Caribbean) Games in Barranquilla, Colombia in July. At the CAC Games, Campbell earned one gold medal, in the road race, and three bronze medals, in the scratch, omnium and individual pursuit respectively. This cheque forms part of the Rewards and Incentives Framework of the recently-launched National Policy on Sport, which will see many of the TT athletes who medalled at international competitions, being rewarded for their accomplishment and for bringing international recognition to TT. The 21-year-old Campbell, who currently trains at the UCI World Cycling Centre (WCC) in Agile, Switzerland, became the first female cyclist to be awarded the Hummingbird Medal - Silver. In addition to her recent success at the CAC Games, Campbell also successfully competed in several meets across Belgium, France, Norway, Thailand and the Netherlands. Reply to "Cyclist Campbell pays courtesy call to Minister Cudjoe"